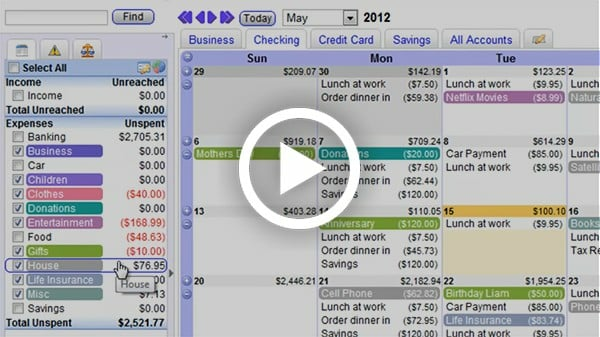 CalendarBudget, the easy-to-use budgeting software is the best way to organize your money online. 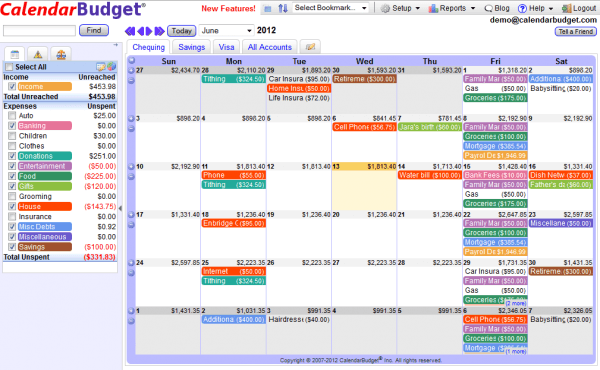 CalendarBudget is web-based online personal finance software that runs in your browser or mobile device. It is designed to be easy to use and to allow you to both TRACK and PLAN your money in the past and future. Its an easy to use online money planner with no complicated system that takes weeks to get used to - just walk up and use! Let's face it; we think about money the same way we spend it, day-to-day, not summarized by month or in a long list of transactions. CalendarBudget, the best personal money management software, tracks and forecasts your use of money in the same way you actually use it, day-to-day, on a calendar as financial planners have long recommended. 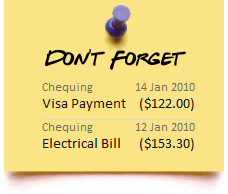 Also, avoidable problems like bounced checks, overdraft charges, insufficient funds and over-use of credit can be predicted and prevented since CalendarBudget allows you to plan ahead and see when the funds will be available in your account.